It may not have the official name (that's lost somewhere in Activision's archives), but upcoming PC adventure game Precinct is, from the designer down to the fundamentals, trying to be something fans of the classic Sierra series will be very interested in. Police Quest founder and designer Jim Walls is leading development on the project, which sounds like it will mostly follow the original series' template, albeit with some modern twists. 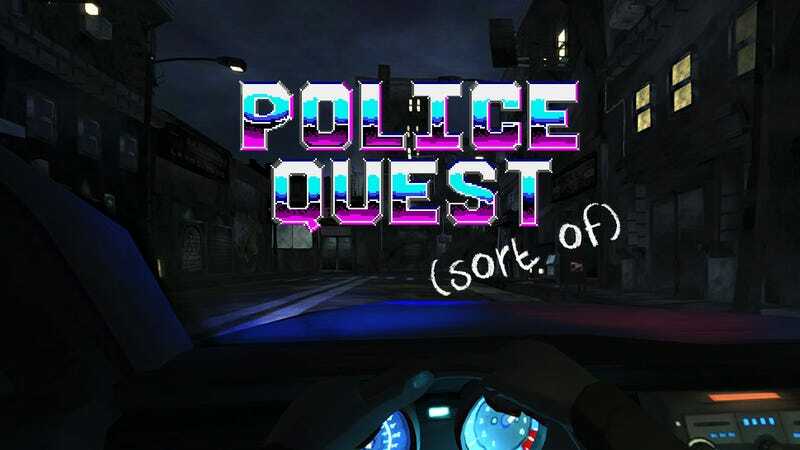 The old Police Quest games were notorious for making players follow the letter of the law in everything they did - thanks to Walls' time as a police officer in the California Highway Patrol - and Precinct is no different, as you'll need to "follow correct police procedure". The big difference now though is that Precinct will be played in the first-person perspective, and alongside traditional adventure game puzzles and dialogue there'll also be "intense fast action gameplay sequences" like "shootouts, high speed car chases, investigations, foot pursuits, hand-to-hand combat, and more". Police Quest veterans will remember there's always been a bit of fast-twitch reflexes needed at certain points in the series. Hopefully it'll now require less save game reloads to get right. Currently seeking funding via Kickstarter, the plan is to create a five-game series for the PC, with additional formats to be included if they hit their stretch goals. Those interested in the game - or even adventure game history - should check out the Kickstarter page, because the pitch video doubles as a great little Police Quest documentary.